Just when did John Walton register? Is this maker John Walton? 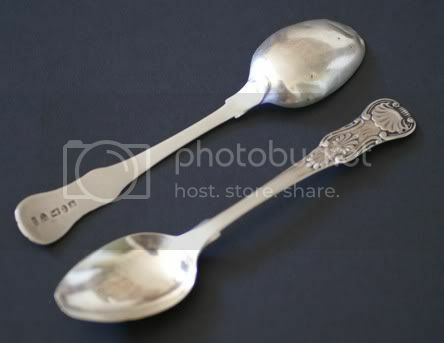 I have 1809, 1811 and 1812 spoons which look very similar to his mark, yet my reference book says he registered in 1820. Without giving your question a whole lot of thought, could they in fact be 1833, 1835 and 1836? I ask because that's the only way, off the top of my head, that makes everything fit. Newcastle were slow to change to change their Duty marks, I don't know if that was their fault or whether the Comissioner of Stamps was slow to provide them with the punches, but I suspect it was the latter. I've just noticed a Newcastle spoon of 1840 with William IV's Duty mark. John Walton and some of John Wright's marks are amazingly similar and their working lives overlap, a similar situation occurs with Thomas Watson and Thomas Wheatley. Walton's working period, on his own account, was as far the Newcastle Assay was concerned, was from the 8th December 1820 until 13th July 1866 and Wright's, again on his own account (he was formerly a partner in the firm of Lewis & Wright/Wright & Lewis) was from 10th December 1824 until 8th April 1845. Having said all that, if I had seen those marks without knowing the working periods of these two smiths, I would have dated them exactly the same as you did. Yes, I think you're right Trev: those dates fit in better with King's pattern as well as the maker. This must be more than a matter of geography. The London assay office didn't get on well with the English provincial offices, but why is Newcastle unique in this respect? I thought it might just be the case with small spoons (which are often left behind in hallmarking developments), but I found George III on an 1827 table fork. Very peculiar. I've just seen an 1838 salt spoon with a William IV duty head.